By now, most of us are aware of the problems that have been going on in a "ranch" in Eldorado Texas as 416 children were removed from the ranch after a 16 year old girl called the police to say she was abused. Those on this ranch are members of the Fundamentalist Church of Jesus Christ of Latter Day Saints. This faith practices polygamy in arranged marriages and believe the lifestyle brings exaltation in heaven. There are several aspects I would like to bring out in this message, both as the director of Shattered Men, and as an ordained pastor. a hostile and sinful outside world — center on family and faith. They can leave the ranch to go shopping and are not "locked" in. On Thursday, a custody hearing starts to decide whether the children, will be placed in permanent state custody. State officials alleged a pattern of abuse by adults, including marriages between young girls to older men. Sect members deny children were abused. what they did. On the other hand, many abuse centers need victims and they create them where none exist by saying anything their clients do not like is abuse. address this when I come to the part where I am addressing this as a pastor. Before then I want to address the forgotten victims of this situation. These are the victims very few have spoken about. forced to leave this ranch by the age of 13. Many are forced out with no place to go. Up to a thousand teenage boys were simply dumped on the side of the road with no place to go. They are on their own. My friend…THIS IS ABUSE! Why have so few talked about this aspect of this ranch? 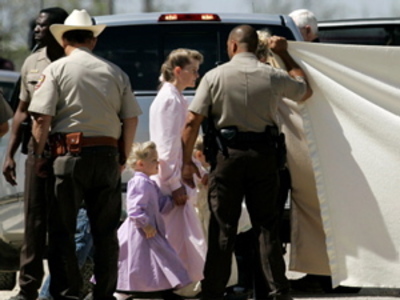 Joanne Suder, a lawyer representing some of the Lost Boys in a case against the sect, said there had been "a conspiracy to excommunicate young boys to change the arithmetic so there are more young girls available for polygamy." She said some of the boys were simply driven out of town and dumped on the side of the road, leaving them traumatized. "I think anyone who finds themselves ousted from the only environment they ever knew and left in the middle of nowhere, and then is not allowed to be with their family and loved ones, and is led to believe that they can no longer go to heaven, is going to be troubled," Ms Suder told The Guardian. At the start of this message, we stated "This faith practices polygamy in arranged marriages and believe the lifestyle brings exaltation in heaven" What does this mean? Well, the Mormon Church used to teach that men can become a god by multiple marriages. (It is my understanding that women can only become the wife of a god) They also teach that GOD use to be human just as we are now and He advanced to the level HE is at now. I do question that if they really felt that GOD told them to do this… why they gave it up so easily when the government told them to stop polygamy. monogamous arrangement to become corrupted. Polygamy became an accepted social custom (Gen. 16:1-2; Deut. 21:15). In fact, many of the Kings of Israel were polygamists. The norm, however, was, and still is, monogamy. our society as we often see society treating men and boys as if they are expandable. The Bible tells us something totally different. God tells us that HE is not willing for anyone to perish and that we can ALL come to Him for salvation. If God did demand that men have three wives to be able to go to heaven, it would seem like there would be three girls born for every boy yet the birth rate is nearly equal. 1: We need to realize we have sinned. Romans 3:23 For all have sinned and come short of the Glory of God This means we have failed to met the goal of being perfect in order to enter heaven. Few of us would question this. Since the only price we can pay for our own sin is to be separated from God forever, it stands to reason that there is no way we can pay for our sin ourselves. We thus come to the 2nd part of Romans 6:23: but the gift of God is eternal life through Jesus Christ the Lord. 3: 2nd Corinthians 5:21 informs us: For he hath made him, who knew no sin, to be sin for us, that we might be made the righteousness of God in him. Jesus Christ, God's only Son became sin for us so that we can be freed from the penalty of sin. What then do we need to do? 5: Many times our own past activities or the activities of our ancestors may be a basis for demonic problems based on Exodus 20:5. It is important therefore to Renounce the sins of our ancestors. Now if we only learn these facts, even though we may understand that they are true and believe them. that is only knowing ABOUT GOD. How do we KNOW HIM then? It is APPLYING that payment to our account. This would be like having a check to pay a bill and putting the check on a desk. The bill does not get paid because the check was never APPLIED to your account. Once we know and believe the facts pointed out above, the next step is to TALK to God much as you and I would and admit that we have fallen short of what He wants. We recognize that we deserve to be separated from a Holy God. We then tell Him that we know that He has provided a payment for all our sin and this payment was Jesus Christ when He died on a cross. It is at this time we ask God to APPLY THIS PAYMENT TO OUR ACCOUNT. We ask God to credit as PAYMENT IN FULL for all our sin the price Jesus paid for us. It is this step that gives us eternal life. If we do all but this step, we know about God. When we do this step, we will KNOW God and we will have eternal life. Following is a model of a prayer to trust Christ. Lord God, I now realize I am a sinner. I realize I have fallen short of the goal You have set forth for eternal life and I now repent of this sin. I also understand that according to Your Word, the Bible, that Your Son, Jesus Christ as paid the debt for me and I am now asking You to credit the payment Jesus made on the cross to my sin. Lord God, I also renounce any sin on the part of my ancestors that may have been invitations to curses or demonic activity. Lord God I also now understand that You have now given me eternal life and I thank You for that fact. Amen.